Gingerbread was always my brother’s favourite growing up. He loved my mother’s gingerbread with hard sauce…especially when it was still warm from the oven. It is the quintessential in a traditional Christmas dessert…filling the house with lovely fragrant smells that remind me of those childhood days. 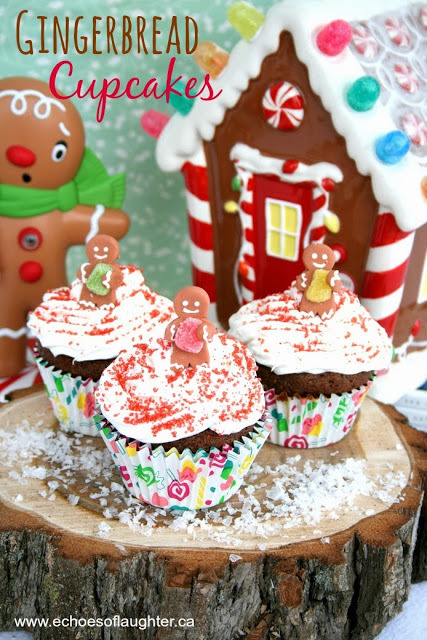 I have updated our family gingerbread recipe into cupcakes with cream cheese frosting with red sugar sprinkles and the most adorable gingerbread men decorations for a fancy bakery look perfect for gift-giving or company or to make with kids. 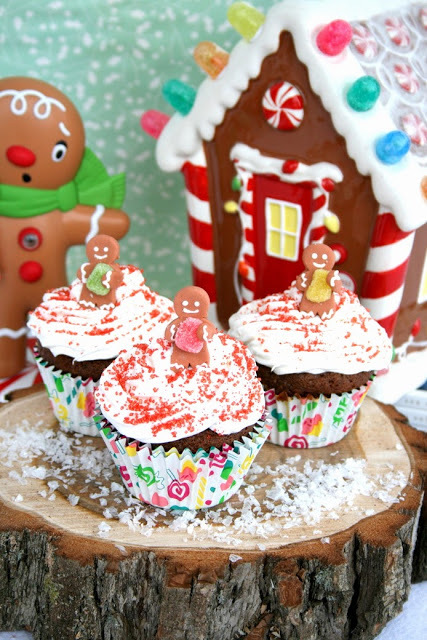 This is our family recipe for gingerbread, and it makes delicious cupcakes too. The texture is heavy & dense and might not be as light and fluffy are you might expect in a cupcake, but they are wonderful nonetheless. They are fabulous with cream cheese frosting and can be made as mini-cupcakes for kids too. 1. Cream butter and sugar. Add egg. Mix well. 2. Add molasses to butter and sugar mixture and mix in. 3. Add dry ingredients. Mix. 4. Add hot water last and mix together. 5. Scoop batter into muffin pan lined with paper liners. 6. Bake for 18-20 minutes, or until inserted toothpick comes clean. 7. Frost with favourite homemade or purchased cream cheese icing Sprinkle with red sugar and add a gingerbread man decoration. You might remember that I was chosen to be a part of the Life Made Delicious program this year where I am able to share delicious recipes and news about the latest products from General Mills. Have you visited Life Made Delicious? There are so many fabulous recipes to choose from and if you haven’t visited already, I invite you to go visit and check it out! Thank you so much for visiting! I love my readers! Disclosure: I am a part of the Life Made Delicious Blogger Program and I receive special perks as part of my affiliation with this group. 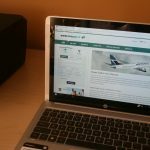 The opinions on this blog are my own. Nice Post Buddy. I love this type of articles. Thanks a lot for sharing with us.I want to help those people who are intrested in Internet and Government jobs. I have also two websites to help them and which are give you lot's of opportunities to build carrer in a better way. Click here to know about how to build carrer through Internet. Click here to know letest recruitments by SBI, RBI, SSC, UPSC, IBPS and other Government job in India…Click here to see some classifieds advertisement may help you. Thanks. Those look delicious. I love old-time recipes. 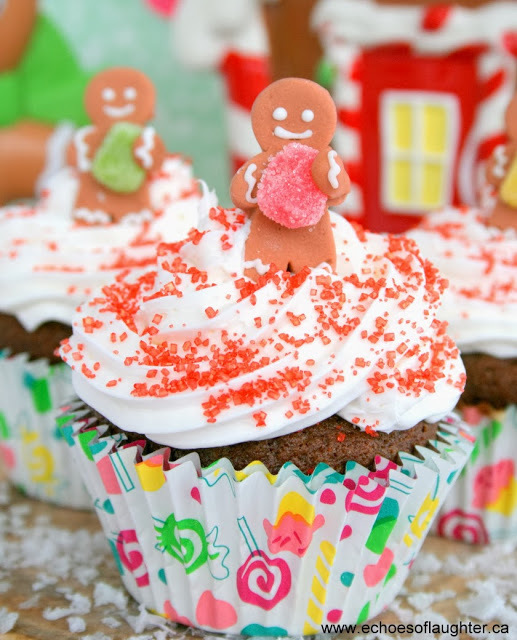 These cupcakes look SOOO delicious! Thanks for the great idea, my kids will love them! Love this recipe! Can I use the recipe "as is" to make gingerbread cookies? Happy Holidays! 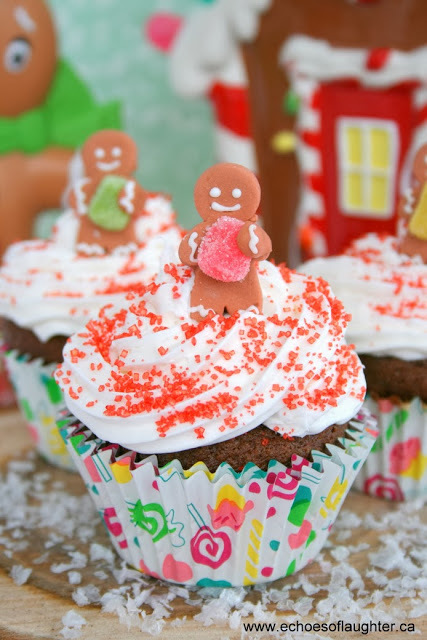 This is so cute, I love your idea of cupcake version instead the classic gingerbread.